1. 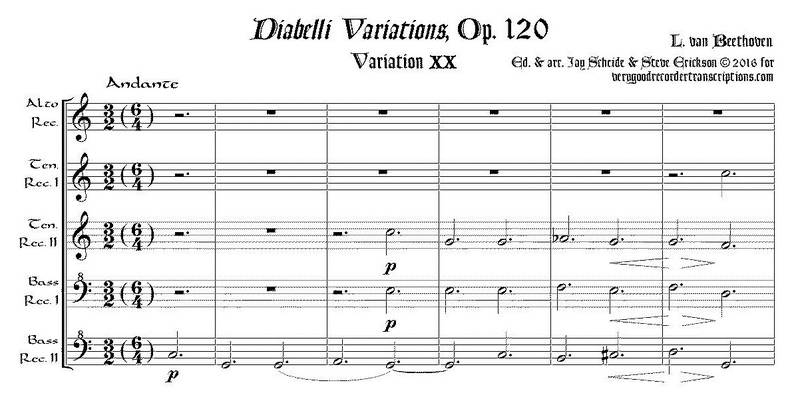 Variation 20 from The Diabelli Variations, Op. 120, in original key of C major, with optional repeats of the the two sections, which are not given in the original. 2. Variation 32 (Fugue) in original key of Eb major. 3. Præludium from the Sanctus of the Missa Solemnis, Op. 123, transposed from G major to C major. Recorder 1 requires Sopranino, Soprano, and Alto. Recorder 2 requires Sopranino, Alto, and Tenor. Recorder 3 requires Alto and Tenor. Recorder 4 requires Tenor and Bass. Recorder 5 requires Bass only.